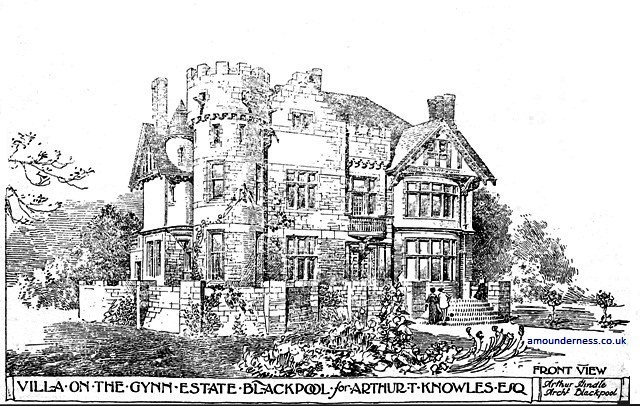 Lytham & St.Annes on the Sea Lancashire - Local History - The Castle, Arthur T Knowles, Blackpool, 1906. YOU ARE HERE > HOME PAGE > BLACKPOOL > The Castle, 1906. The Castle was built on the cliffs at North Shore, near Uncle Toms Cabin in 1906. It was built for his French wife and resembled an old French chateau, however, his wife decided to remain in France and the house remained largely unoccupied for 30 years. This building more recently became a casino which can be viewed by clicking here. Building operations have lately been commenced in the erection of a marine residence for Mr. Arthur T. Knowles. As will be seen from the illustration, it has several novel architectural features, and will constitute an imposing structure on the cliffs near to the present Uncle Tom's Cabin. The site is part of the Gynn Estate and contains 6,360 square yards. It has a frontage to the new Esplanade or King's Drive of 303 feet, and is bounded on the north and south by Richmond Place and Shaftesbury Avenue respectively. The residence contains on the ground floor large dining-room with a circular tower at the north-westerly corner, inner and outer entrance halls, large and small drawing-rooms, which are so arranged as to be available for use either as one or two rooms; conservatory, kitchen, lavatories, servery, butler's pantry. The usual kitchen offices, with heating chamber, wine stores, etc., are in the basement, so arranged that, whilst being easily accessible from the domestic portion of the house, they are at the same time screened from the grounds and the living portions. The main entrance is from the garden on the east, the approach being through a loggia and an inner hall opening into a large staircase hall 20ft. by 20ft. The staircase has been designed to open to the full height of the building, and is surmounted by a circular dome giving light and effect to the staircase. A mezzanine lounge with circular windows overlooking the gardens opens from the staircase. On the first floor will be four bedrooms, dressing-room, boudoir, bathroom and a balcony, also a small turret in which is a staircase giving access to the top of the circular tower. There are also five bedrooms on the second floor. The materials proposed to be employed are Longridge wall stones with white Stainton (Ulverston) limestone dressings, for the exterior walls. Portions of the gables will be finished in half-timbered work richly carved, filled in. with irregular opal panels. A wide embattlemented terrace will form a feature of the front and north elevations. It is proposed to construct the staircase in oak with richly elaborated panels, the dome over the stairs being carried on Corinthian columns. Oak will be the predominating wood for interior furnishings. The floors of the reception rooms will be of parquetry inlaid with teak, walnut, and oak, the loggia and conservatory floors being formed of marble terrazzo paving. It will be seen from the sketch the idea aimed at has been to give a substantial baronial effect to the elevations, at the same time securing the maximum amount of sunlight to the living rooms. The conservatory and the three drawing-rooms are arranged en suite so as to render them easily available for receptions. At the Shaftesbury Avenue end of the site will be erected a caretaker's cottage and motor garage. The tender of Messrs. Dryland and Preston has been accepted for the whole of the work; amounting to £4,200 exclusive of the cottage and garage. The sub-contractors for the work are:-Messrs. G. Collins and Sons, stonemasons; Mr. T. H. Smith, carpenter and joiner; Mr; J. Coulston, plumber, glazier, and painter; Mr. W. Ward, plasterer.The residence is being erected from plains prepared by and under the superintendence of Mr. Arthur Handle, C.E., 44, Abingdon street, Blackpool.